Life is beautiful and stress-free at The Big Sea! Watch the sun rising over the ocean and setting over the sound from the expansive decks. This beautifully decorated home is perfect for your family vacation with a private pool, open floor plan and just a few steps to the ocean and sound. The outside pool area is really beautiful with a large backyard and then a patio area near the private pool for your lounging and dining outside pleasure. A great gathering spot for the entire family. 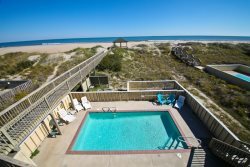 Enjoy community amenities including 2 community pools, tennis courts, sound pier with gazebo great for kids to crab, and boat ramp perfect for kayaks or SUP. Close to Duck Village for easy access to shopping, restaurants and activities. Mid Level: 1 Queen Master, 2 Queen Bedrooms and 1 King Bedroom with a full hall bath, a Large Laundry Room w/ half bath.